Jeffrey Mitchell holds outreach soil health presentations to Tulare County fourth-graders! 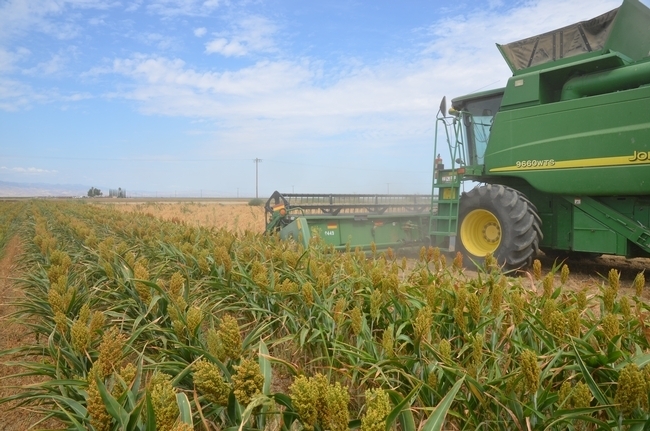 In what might be the sixth or seventh year in a row, Jeff Mitchell, Cooperative Extension systems specialist at Kearney Agricultural Research and Extension Center,UC Davis Plant Science department, and Conservation Agricultural Systems Innovation program participated in the annual AgVentures! educational event for several Tulare County public schools fourth-grader classes on May 11, 2018 at the International Ag Center. This is an annual event that is put on by the Tulare County School District in conjunction with the Tulare County Cooperative Extension and the International Ag Center and it typically involves several hundred students from the local schools. It turns out to be the classic ‘field trip' for kids and seems to be something that brings excitement and hopefully good learning to large numbers of students. A short video of some of the action can be seen at the You Tube site https://youtu.be/R4LDy4Ru9ws. 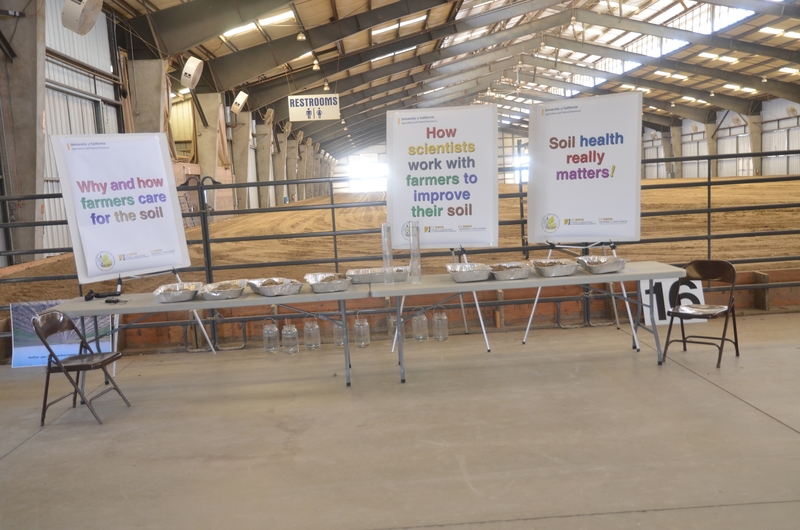 Interactive soil health display materials for Tulare County fourth-graders as part of the 2018 AgVentures! field day. Kearney researcher participates in STEM high school conference at Reedley College. Long-time Kearney Agricultural Research and Extension Center researcher and budding motivational speaker, Jeff Mitchell, participated in the STEM Conference organized for local San Joaquin Valley high school students on Saturday, April 23, and thoroughly enjoyed the interactive, high-energy experience. STEM refers to science, technology, engineering, and math programs and the day-long conference was an effort by the College to stimulate interest and preparedness in interested high school students to pursue educational programs and careers related to these disciplines. Mitchell was invited to share with students his work in agricultural systems research and soil health. He provided two hands-on sessions to a wide range of students from a number of regional schools including Laton, Hanford, Corcoran, Madera, Tranquility, Sierra, Selma, Reedley, and Parlier. The highlight of the day, however, was the motivational and music extravaganza provided by special conference guests, Domino Saints, a bilingual urban pop duo from San Juan, Puerto Rico that includes David Leal, a young and very creative mechanical engineer with several nuclear fusion technology patents, and Gisele, “Gigi,” Ojeda. Students and presenters were wowed by the infectious music and inspirational message provided by Leal. Students at Reedley College's 2016 STEM conference attending Jeffrey Mitchell's workshop. The October 30 issue of the Sacramento Bee op-ed included an article on soil health by Jeff Mitchell and Randy Southard. An Op-Ed article written by Jeff Mitchell, CE Cropping Systems Specialist in vegetable cropping systems, irrigation management, soil quality, organic soil amendments, extension models, and postharvest physiology in the Department of Land, Air and Water Resources at UC Davis and at UC ANR Kearney Agricultural Research and Extension Center and Randy Southard, Professor and Soil Genesis/Morphologist in the Department of Land, Air and Water Resources at UC Davis was included in the October 30 issue of the Sacramento Bee. More information on conservation tillage practices can be found on the Conservation Agriculture Systems Innovation (CASI) website. 2015 garbanzo harvest in July at Five Points, CA. 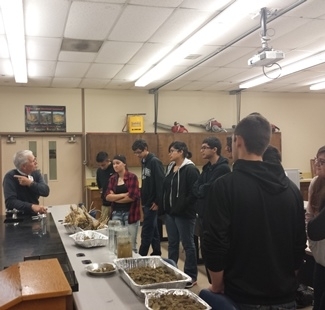 Jeff Mitchell increases student awareness of the importance of soil health at the Reedley College 2015 STEM Conference. Mitchell shared how he became an extension specialist, emphasizing that broad life experiences can often help you discover your passion and lead to satisfying career choices. Students learned that we will have an additional 3 billion people by 2050. This leads to the problem that the estimated food production demand from 2010 through 2050 will be 730 Exacal (an Exacal is 1018 calories), which is more than the demand we had over all of human history. Related problems are that we risk having a food production deficit and a water deficit. There is a linear relationship between soil organic matter (%) and available water content (%). So, if we need to increase our food production with finite resources, we need to keep our soil healthy and productive. Whichever country develops strategies and technologies that allow the soil health and soil water availability at the root zone to be maximized will be ahead in the race to feed the world. … and will unlock the secrets of the soil. It advocates that the combined economic and social benefits gained from combining production and protecting the environment, including reduced input and labor costs, are greater than those from production alone. Therefore, if a student's passion is to benefit the world by ensuring that there is a sustainable, safe, affordable and abundant supply of nutritious food, feed, fiber, housing and water, then a career pathway in agricultural engineering, biological engineering, agronomy, soil science, plant science, genetics, entomology, nematology, plant pathology, agricultural economy, and other related STEM fields of study are all good choices. Students were able to see the benefits of an ongoing conservation tillage trial that is being conducted at West Side Research & Extension Center. There were samples of conventional and conservation tillage soil. Students noted that the conservation tillage soil was able to hold its shape while soaking up water when dipped in the water, and that the conventional tillage soil dispersed into the water. Jeff Mitchell teaching students about the importance of soil productivity and conservation agriculture strategies.